We don’t get much fog around these parts, well only occasionally anyway. So you can imagine our surprise (and panic) when we woke up to thick fog on our recent delivery trip down the coast of the South Island. We didn’t have a radar reflector either, so we weren’t sure if ships could see us. Yachts don’t make a very good target for the radar to bounce off of, so apparently we can just appear as a bit of clutter on the screen and not a nice strong dot on the radar screen. Our friend Kent had suggested on the trip up, that in the absence of a radar reflector, you can use some scrunched up tin foil in a plastic bag and hoist it up the mast. So with nothing to lose, that is exactly what we did! We sat in the cockpit and swivelled our heads from side to side wondering if we might hear a ship in the distance before it emerged and ran us over…! One minute we would be in a clear patch, and then straight back in to the pea soup. On consulting my “New Zealand Weather” book, they say that fog is simply cloud resting on the earth’s surface. It forms when humid air next to the ground is cooled enough to reach saturation point. Radiation fog is caused by the loss of ground heat via radiation in to a clear night sky. A body of water like a lake, or a river for moisture or near a coastline like a surf beach provides the moisture. There needs to be just the right amount of wind to mix the cold land air and the warm moist air together. The warm moist air moves over the cold ground and reaches its dew point forming fog. You can tell if you are in radiation fog if the air temperature is lower than the local sea temperature. Once the air warms up its dew point will rise and the fog will dissipate. This fog is usually only found on land and around the coast. Advection Fog is caused by the movement or advection of air. This is more common over the sea. It is caused by warm air from the tropics blowing towards the poles. When the air encounters a sea surface temperature which is lower than the air’s dew point, it will cool and condense in to sea fog. This fog can linger until a new weather system moves in. This can occur in Spring when there are cool seas and increasing air temperature. Sea fog can also occur when cold ocean currents meet warm ones – in the case of the Labrador current meeting the Gulf Stream, which is about 17 degrees warmer! Or when cold air moves over relatively warm water – air cooling at night over the land flows down hill and over the water, when the water evaporates it mixes with the warm air and condensates causing fog. Or when relatively warm humid air blows from the sea over the cold land at night. It is most common on clear nights with light winds. Freezing fog can occur if the temperature of the fog goes below zero. The tiny water droplets remain liquid until they come in to contact with something solid. This is caused rime ice, and is dangerous to boats as it freezes quickly and builds up quickly making the vessel top heavy and unstable. Fog clears when it evaporates with the sun in the morning, or wind changes blowing the fog away. Mist is just thinner fog – where you have over 1000m visibility. 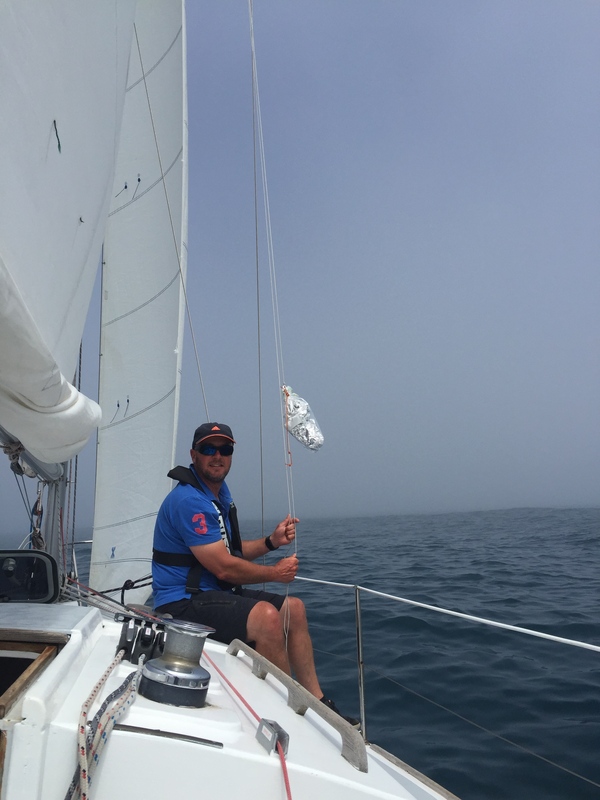 We were unsure how long we had been sailing in the fog for! It was just there when the sun came up, so we could have been sailing through it for ages. Things had certainly felt quite damp and dewy in the night, and upon reading the books, this is an early forewarning that fog is about. But when daylight came, we felt quite vulnerable. We had our GPS, so we weren’t worried about running aground as we had a pretty good handle on where we were. We also had the Marine Traffic app on Andrew’s phone. We didn’t feel 100% confident with that, but at present it wasn’t showing any ships nearby so that did give us some reassurance that a huge ship wasn’t about to emerge through the gloom and run us over. What we really needed was radar or AIS, but it is probably a bit of overkill on a Young 88. But at that moment we would have quite happily traded our bag of tin foil for a nice shiny radar reflector! I had a brief moment of trying to call up on Channel 16 “Is there anybody out there…? !” But thought that might sound a bit strange. It is also quite disorientating sailing in fog. With no horizon or landmarks to focus on, you have to keep your eye on the compass to make sure you are still heading in the right direction. At one stage I lost focus for a second and we ended up on completely the wrong course. We decided to set the auto helm on steering after that! So what else could we have done in this situation? Increase your visibility – run your nav lights and put your sails up – tick we did both of those. Keep a good lookout – there was just the two of us on board, and the other absolutely had to sleep as we had been on opposite watches all night, so it might have been good to have both of us on watch, but we made do with one. Radar – if we had it we would have absolutely used it! Listen – I certainly found my other senses were on high alert, although with our own engine running it was difficult to hear much else. 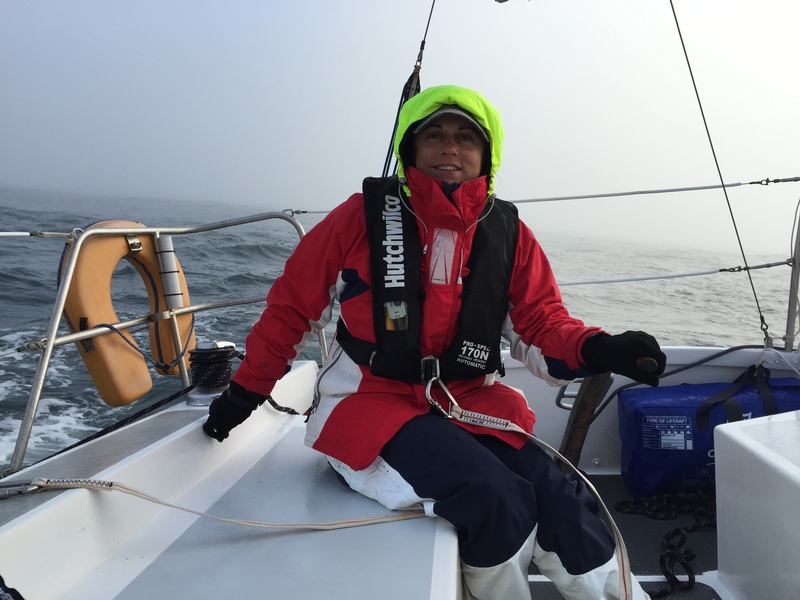 Reduce speed – we had the current against us so were only doing about 4 knots. Hard to go any slower than that when we were also keen to get home! Here is what we should have done and had we heard other boats making noises, what we could have expected them to sound like! (h) Aground: same as ‘anchored’ plus 3 strokes before and after bell ring. I had better learn these, as I believe they also form part of my Ocean Yachtmaster study, plus it might come in handy on our next voyage! Eeek that must have been terrifying! Thanks Ellen! What brand is your AIS? We are planning on doing some research when we go to the Sydney Boat Show. Big ships don’t always sound their fog horn these days although it’s still in the regulations, and unlikely that a big ship would hear your fog signal anyway, as the look out will be behind glass in the enclosed bridge, keeping warm and cosy. Probably the best for your size of boat is one of the active reflectors, such as the the ‘Sea Me’, although expensive. Thanks Jim! Yes that’s what we figured re our fog horn too. I will check those Sea me reflectors out & good to know re the tin foil – we weren’t 100% sure it would work, but were willing to give anything a go! I can attest that the fixed metal reflectors do work fairly well, this from the guy looking for small boats in the fog so I don’t run them down.